We're a group of people who are passionate about mountains and the outdoors. We're based in Edinburgh but also have several members living in different parts of the UK. The club welcomes new members who are experienced hill walkers and are over 18 years of age. We have about 60 members at the moment, with roughly the same number of men and women. We think there are a few reasons why you might consider joining the EMC. We are a small, friendly club - once you have been out on a couple of weekend meets you will know many of the people in the club. We have a diverse range of mountaineering and other outdoor interests including hillwalking, climbing, skiing and cycling. 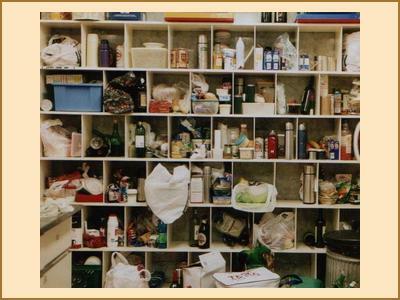 We are a club where everyone is seen as having something to contribute provided they are enthusiastic. Most trips have an eclectic mix of ages, activities and abilities that are all accepted for their own value. For more information, please consult the New Members FAQ and Meets FAQ below, and contact our Membership Secretary. I'm a hill walker. Isn't mountaineering a bit hard-core and serious? Many people who join are keen summer hill walkers who would like to push their level a bit and join up with other walkers who they can learn from but not feel 'led' up and down the hills. Joining the EMC allows you to do things that you are comfortable with but which you might not have attempted by yourself. It might be making the jump to winter walking, doing more serious Munros that involve scrambling (Skye, Aonach Eagach, An Teallach), getting into scrambling, rock climbing or winter climbing, or bagging some of the more remote munros in Scotland that require a weekend away like Glen Affric or Knoydart. Whilst we don't provide tuition and people take responsibility for themselves, many of our members are highly experienced mountaineers and keep an eye out for others offering suggestions. 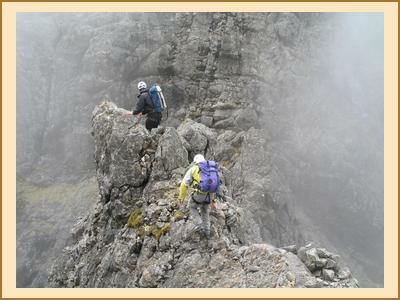 With the EMC you will have the opportunity to develop your all round mountaineering skills. Do I need to be able to climb? Of course not! Whilst we have a very active group of climbers in the club, an equal proportion of members do not climb. But if you are an experienced hill walker who is also keen to try climbing, the EMC provides an opportunity to do this provided you know how to belay. The climbing page has more information about climbing with the EMC. 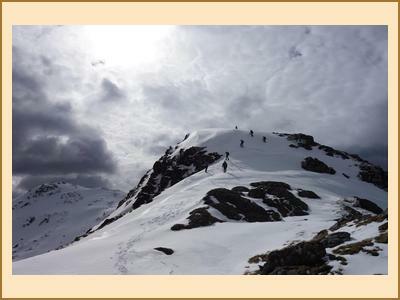 The club is for experienced hill walkers - many of our members have climbed all the Munros, and are mopping up Corbetts or Grahams. You don't have to be that experienced, but most new members will have already climbed a good number of Munros or equivalent. 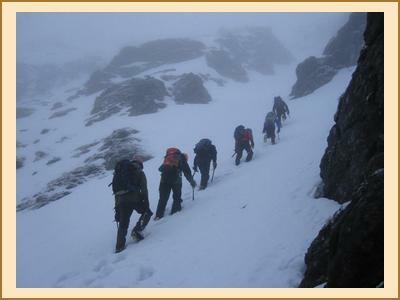 have the appropriate equipment (including ice-axe and crampons in winter) and the skills to use it. Fitness levels vary across the club. We have quite a few members who can set a very demanding pace on the hills. However, we are not all super athletes and there are plenty of folk who are happy to go at a more leisurely pace with tea stops! Ideally you should be comfortable walking for at least 6 hours up and downhill (a typical hill day may have more than 1000 metres of up and down) at a reasonable pace. If you're very new to hillwalking or haven't climbed a fair few Munros/Corbetts or equivalent before then you may struggle to keep up and the club would not be suitable for you at this stage. In this case we can recommend other clubs/groups that will allow you to gradually build up to doing the bigger hills. Is the club suitable for me if I am mainly interested in climbing? Yes of course! As well as walking, we have an active group of climbers (see the climbing page) in summer and winter. As most of us are also interested in hill walking as well the climbing focus tends to be on mountaineering routes and cragging rather than bouldering. Other occasional activities include skiing, cycling, running and checking out the nearby gear and coffee shops because the weather's too grim to contemplate a hill. Does it matter if I don't have experience in winter? Not necessarily. However, if you've never used an ice axe and crampons before then we'd very strongly encourage you to do a winter skills day/weekend prior to coming out on a winter meet. What about walking or climbing outside the meets? If you have a trip that you fancy doing you can e-mail the members' list to see if anybody else wants to join you. Whatever you have in mind, there is usually somebody else that it appeals to. 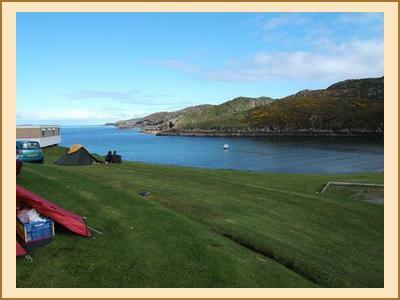 Some recent trips outside club meets have been to Rum and backpacking in Fisherfield and Knoydart. How old are most members? We have members ranging in age from their twenties to seventies with all new members welcome as long as they are over 18 years old. Excellent. I'm keen. How do I find out more or join? Contact our Membership Secretary who deals with new enquiries, and tell them a bit about yourself and your interests/experience. They can add you to the mailing list for prospective new members and/or the climbing e-mail list and answer any initial questions you have. You're welcome to attend pub nights, and two weekend meets or climbing sessions (indoor or outdoor) without becoming a member - for climbing sessions you'll need to have the appropriate experience. However to book onto any further meets or climbing sessions you'll have to pay the current season's subscription. The cost of the first year's membership depends on the time of year; usually £20, but reduced to £10 between 1st January and the AGM in March. At the time of the AGM, annual membership (of £20) becomes payable for all members, and should be paid at the AGM or the first meet attended thereafter. The regular pub night is on the first Thursday of the month, at the Barony Bar, Broughton Street, Edinburgh from 8:00pm onwards. Click here for a map. What are the other benefits of joining? We have a members-only email list for arranging trips and sharing news. Your subscription includes club membership of the Mountaineering Scotland which gives you access to affiliated club huts, discounts on top quality winter skills training courses, a regular magazine and, most importantly, third party liability insurance cover. It also means you are eligible to apply for BMC travel insurance. We are invited to club discount nights at Tiso's in Edinburgh and members are entitled to a range of other discounts with other outdoor providers. How is the club organised? The club's constitution is available online. Details of the current committee can be found here. EMC Meets FAQ: What happens on a meet and how do I book on? When and where are meets? The club runs weekend meets approximately every third weekend throughout the year. These cover a wide range of venues throughout the Highlands with occasional trips to Southern Scotland and the Lake District. With the exception of holiday weekends and New Year, the accommodation is typically booked for Friday and Saturday nights. See our current meets programme for more details. On holiday weekends and the summer we will try and go further afield to the north-west of Scotland and Skye. How do I book a place on a meet? The booking rules apply equally to members, and to non-members that have not yet attended two weekend meets/climbing sessions. If you are not a member we will ask you to pay the meet fee in advance. No priority is given to members over non-members. The committee member responsible for a meet will take bookings for hut meets by text (preferred) / telephone / email from 6pm on the date advertised on the website. This is usually one calendar month in advance of the meet. Telephone bookings should not be made after 10pm. You can also book on behalf of (at most) one other person. If you book on a meet and then cancel, your fee is forfeit unless a replacement is found. If you book on behalf of someone else, you are also liable for their fee in the event of their cancellation. For camping meets there is no requirement to book although the meet organiser will generally email members a couple of weeks before to ask who is intending to go. Potential new members should be aware that the majority of meets fill all their places on the first night of booking, or within a day or two afterwards at the latest, and plan ahead accordingly. Please note: The meet organiser has the right to not accept a booking on a meet from a potential new member if they judge that person not to have the requisite skills/experience for the purposes of the club. What happens if a meet is oversubscribed? In general, the places on a meet are assigned on a first-come, first-served basis. However, during the first four hours of booking (6pm until 10pm, as defined above), all telephone bookings are given an equal priority (ahead of any email bookings). If, during this period, there are more telephone bookings than places, then a ballot is held at the next pub meet in which the places are filled by "drawing names from a hat". Once a meet has been fully subscribed, a reserve list is maintained in case anybody drops out. The first people on the reserve list are those that failed in the ballot, in the order that they were drawn. After that, places on the reserve list are assigned in the order that the applications are received. Places on a meet that have been allocated are not transferable, except to those at the head of the reserve list. 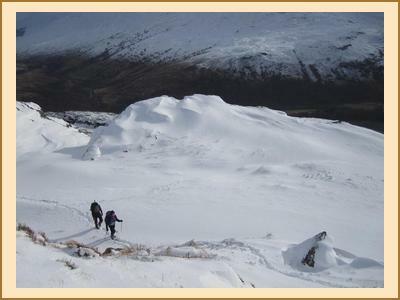 Accommodation for winter meets is usually in a bunkhouse or a mountaineering club hut. Over the summer we have a mixture of camping and bunkhouse / hut meets. The standard of accommodation varies. Mountaineering club huts tend to be well placed for the mountains but basic and inexpensive (not all have showers). Many of the bunkhouses are very comfortable, and some even boast saunas or hot tubs. Campsites are generally quiet / out of the way. 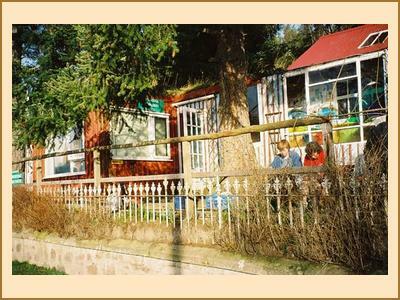 Accommodation costs vary from around £10 for club huts / campsites to £16/£20 per night for bunkhouses. In addition to all your normal walking or climbing gear, a sleeping bag and sometimes a sleeping mat are required for hut meets. For camping meets a tent, stove etc is needed as well. For all meets, you should also bring enough food and drink for the weekend. If there is a hotel / pub nearby often some members will eat out. The meets organiser will let you know what you need to bring. We usually leave Edinburgh between 5 to 7pm on Friday evening and return to Edinburgh on Sunday evening. Accommodation usually opens from around 4pm. There's no set programme during meets. Plans for each day's activities are usually discussed the night before, and people divide into small groups so that they can walk or climb with other people with similar aims for the day. The meet organiser will try to make sure you link up with a suitable group, but you are responsible for your own activities and for your own safety. Transport to and from meets is usually by private car. We try to keep costs and environmental impact to a minimum by sharing lifts where possible. If you can offer a lift/if you need a lift, then, please email the members list or let the meet organiser know. Potential new members requiring a lift must advise the meet organiser of this when you book on to a meet as PNMs cannot email the members directly, however, the meet organiser can do this on your behalf. If you do need a lift then you may need to be flexible on when and where from you get picked up and a lift can't always be guaranteed. If you car share you will be expected to contribute to the petrol costs. Depending on the location and petrol sharing, a typical weekend will cost around £60-70, which covers accommodation, transport and your food and drink. Additional costs could be food or drink en route on Friday or Sunday.